I ran a Malaise trap at my log house continuously from this last Friday, May 31, through today, Sunday, June 2. This was the second time I had run it this Spring--the weekend two weeks ago being the first. Compared to last year I got started later this one--this has been a much colder and more delayed Spring than normal. These eight species were all taken within an area encomapssing a circle about 50 feet in diamter, in either a Malaise trap, or individually on a pile of firewood. This firewood was originally stacked in a row alongside and somewhat removed from my house. Over the years I've let it rot to attract insects rather than use it in my fireplace. Six of these eight species will also eventually be placed in other genera; however, I am using the old names here as I haven't published the new genera yet. It is worth noting that most of those six and even the true Laphria, are generally small insects; only the largest individuals of Laphria sericea are anywhere near the linear dimensions of the twospotted bumble bee queens (Bombus bimaculatus) that are common in the woods around my house at this time of year. None appraoch this bumble bee queen in bulk, and in flight none could be mistaken for it (the queens have a slow, hovering type of meandering flight, as if they were searching for something--which in fact they probaby are). Laphria s. lat., in contrast, have a fast, direct flight, and though oft apparently randomly repeated, is in any one instance essentially from place-to place; further they rarely hover except just prior to landing. The comparison may be different later in the season, with first generation bumble bee workers, which are both much smaller and behave differently than the queens. 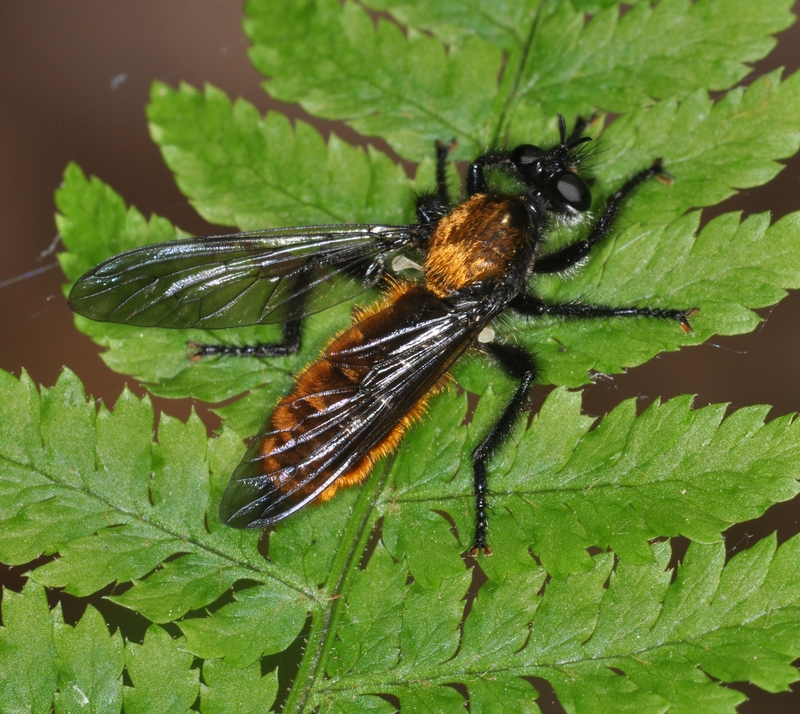 I've also taken a number of other robber flies at my log house, which I won't list today. In general I've only managed to get one or two individuals of each non-Laphriine species over the years; the Laphrines in contrast, have been quite common, as my house is surrounded by an old oak-maple hickory forest, with some trees in my immediate "back-yard" having boles in excess of five feet across. Lest anyone think that I am living in Paradise or that Mother Nature is all hunky-dory I should also mention that the woods around my house are infested with White-tailed Deer--which can't be hunted --and more importantly with deer ticks. I tried to mow my postage-stamp front yard on Friday and as a result dug a total of 12 pin-head sized ticks out of my legs after about an hour's work. Ten years ago I actually caught Lyme disease from a tick bite in my yard; and although I discovered it pronto and got rid of it with antibiotics, I have no wish to contract it again. I got a prescription for Doxycycline yesterday and took both pills as directed last night. I have a checkup in a week so if I did contract something I should be able to catch it in time. Part of the problem I think is that I am gone a lot and when I'm absent the deer eat the lawn grass and bed down in the yard. Hence the large number of ticks. Anyway, it's sort of ironic that my own yard is as dangerous as any tropical, mosquoito-infested swamp. When I had Lyme disease a decade ago I felt as if I'd aged 30 years in about a week, could hardly move my fingers, and had a continuous splitting headache for several weeks straight. On Saturday I was out-and-about roaming through the woods as well with my camera. I managed to get a shot of what I thought at the time was probably Laphria aktis. I thought it might be L. aktis mainly because of its small size compared to some of the L. sericea I collected in 2012. I can't be sure, though, because I didn't collect the fly. Now that I have a bona fide male from the Malasie trap I am even more willing to beleive that the female I photographed was L. aktis. Although both the male and female terminalia of these two species are quite distinct, the two species otherwise look almost alike as adults, and more importantly are found together and apparently act similarly. I suspect that whatever serves to separate the two ecologically does not involve the imagos. The photo is below. It's not the best but it's the only one I have of what is probably a live L. aktis.